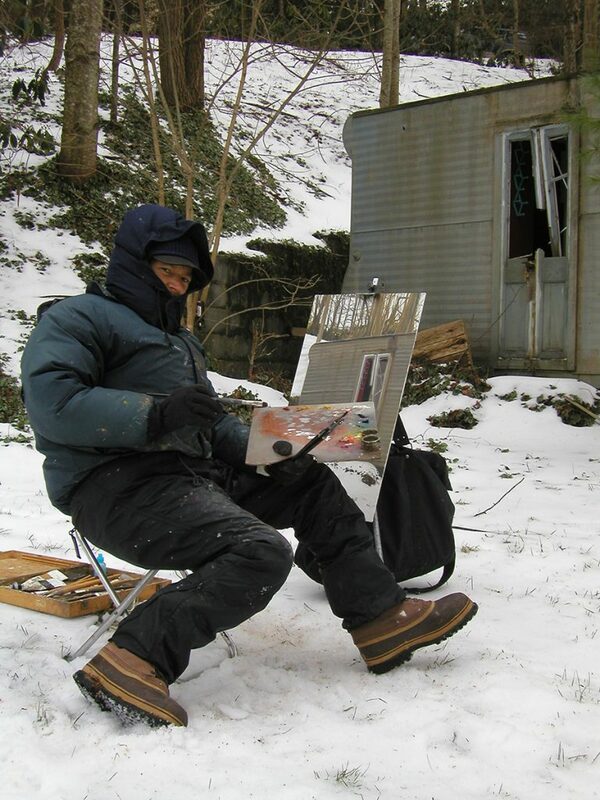 In the summer of 2001 I was in Boone, a small town in North Carolina, in the Appalachian Mountains. Founded by Daniel Boone, he came from Pennsylvania. So did I, arriving from Pittsburgh where I had spent the previous four years. In that city I had found a lot of inspiration for my paintings, with such abounds in architecture. Not quite the case in Boone. And within its single street in town I felt a little disoriented at first. The trailer that inspired this series of paintings was a few minutes from that street. I found it biking. And the presence of it, abandoned and deteriorated, was depressing in the eyes of the neighbors. Initially a detail attracted me, the funny way in which a fan-shaped curtain was hooked on a broken window. This inspired my first composition, without having initially in mind to develop a whole series of paintings around it. The only human element without appearance of damage was a sign attached to a tree that read: PRIVATE PROPERTY. This deterred me from trespassing and sneaking inside the caravan. 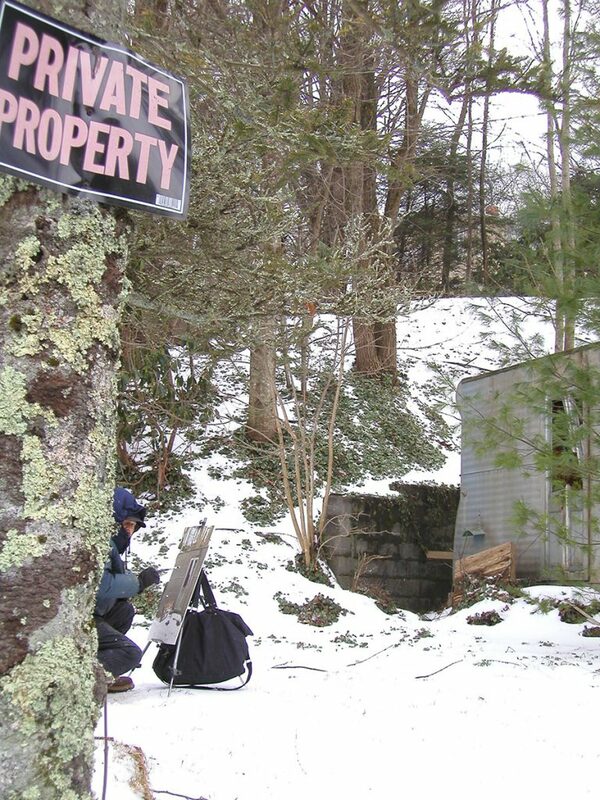 In America private property is a serious matter. And over the course of several weeks I continued working on other perspectives from outside. But because during all that time nobody seemed to have any relation to these premises, finally one day I decided to enter. Although it was already visible from outside through the windows, I found its interior appearance strangely suggestive, with empty bottles of beer, wine and other spirits in the floor, a mattress lying in the middle, broken glasses… I stepped inside very carefully in order to not move any object. And through the ruin I wanted to imagine what could have happened there, what kind of family had sheltered, what circumstances would make them move and leave everything behind like that. I thought then that it was worth the risk to paint some interior views, although it was possible I could get arrested or even shot. But finally, I trespassed. I got into the caravan. Little by little I was discovering curious details and clues, like an ornament hung with an inscription: THE ORNAMENTS OF THIS HOUSE ARE FRIENDS WHO VISIT IT. It was ironic reading it now, under these circumstances. When I decided to put and end to this series, the curtain was still anchored although its appearance had changed. Or maybe I saw it with different eyes. When I resumed my work every day, I was afraid that before I could finish my work, that fan-shaped curtain could be detached at any moment from its fragile hold, by a gust of wind, by the weight of the rainwater, by a casual stroller… To paint on site, in a world so evanescent, is to be hanging by a thread, always in struggle against time.